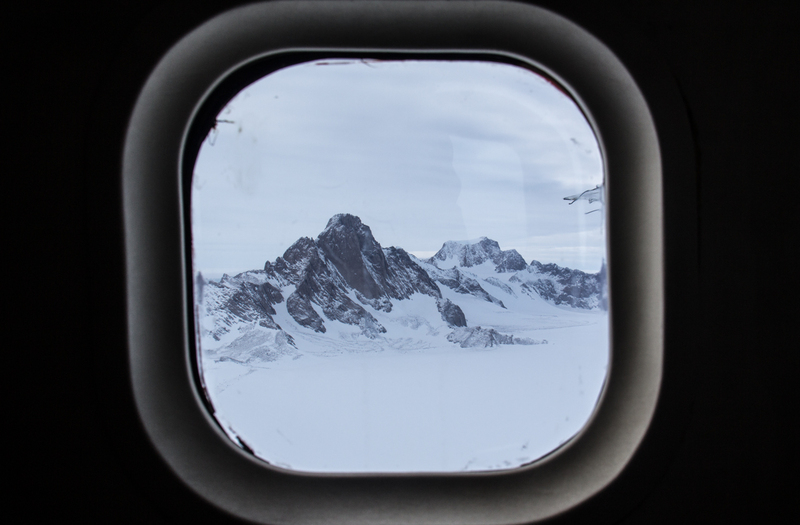 “Down South” (meaning the USAP and Antarctica) flights happen almost daily through the summer season to field camps and Pole. It’s at a bigger scale, more planes involved, more crews. 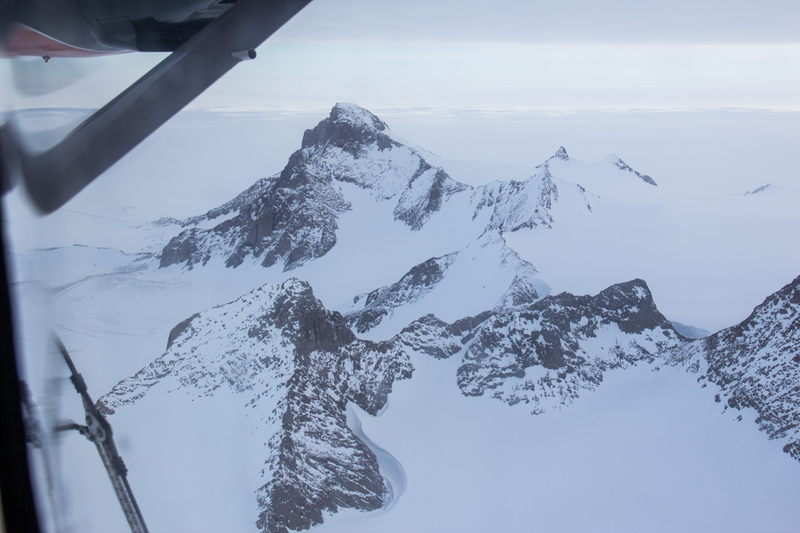 Up here in Greenland we have Flight Periods during which a few hercs at a time fly up to Greenland and complete missions to Summit. This means that we have a week or so of intense flight activity, one or two flights a day, and then a break of 2-3 weeks without any flights at all. 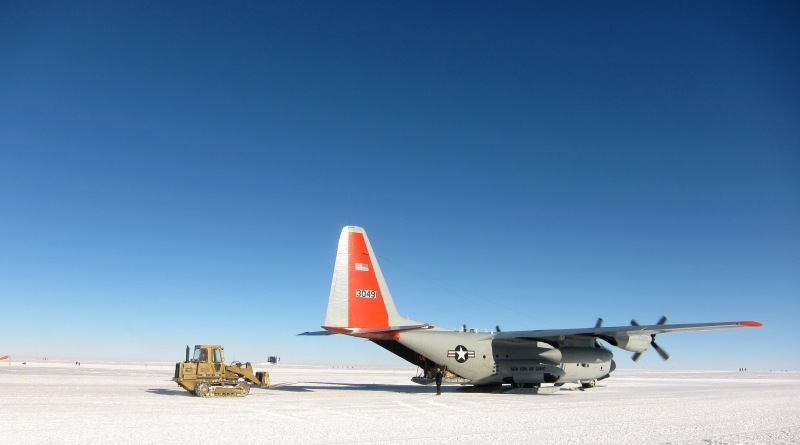 The arrival of an LC-130 Ski equipped Herc is a significant event at Summit. Most of the fuel on station is brought in via plane, so the morning of a flight requires that the mechanic reconfigures our fuel system to receive fuel. 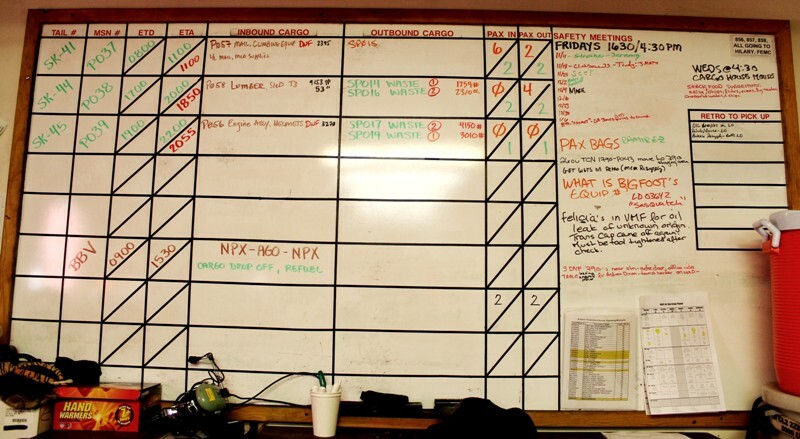 The cargo coordinator is busy prepping and staging cargo. 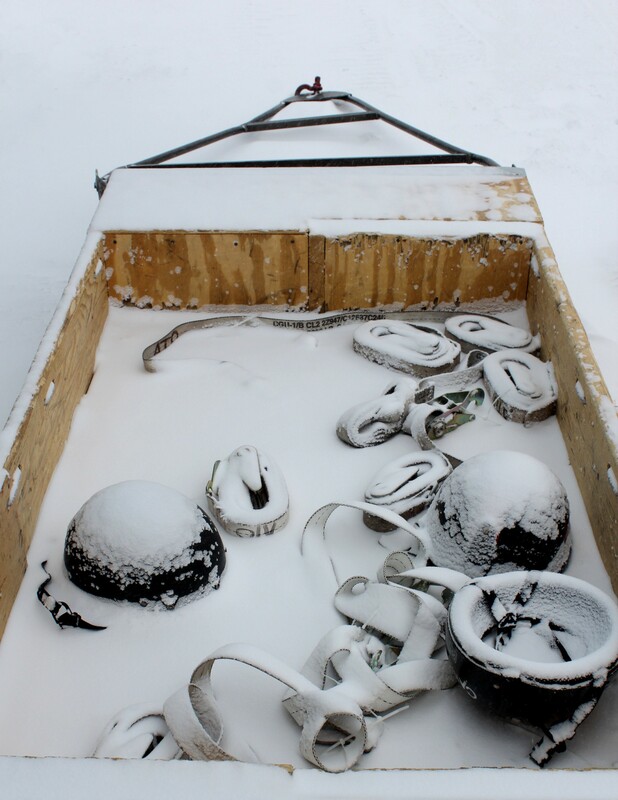 The HEO is involved if we plan to use the cargo sled. The field coordinator is busy gathering loose load, helping with the fuel pit reconfiguration and with last minute cargo issues. As the manager, my role is to provide hourly weather observations, aka wx obs, 3 hours prior to the offdeck (the first ob is usually due at 450am). These are sent to a wide group of folks in the US and around Greenland via email and will determine whether the conditions meet the requirements for the flight. 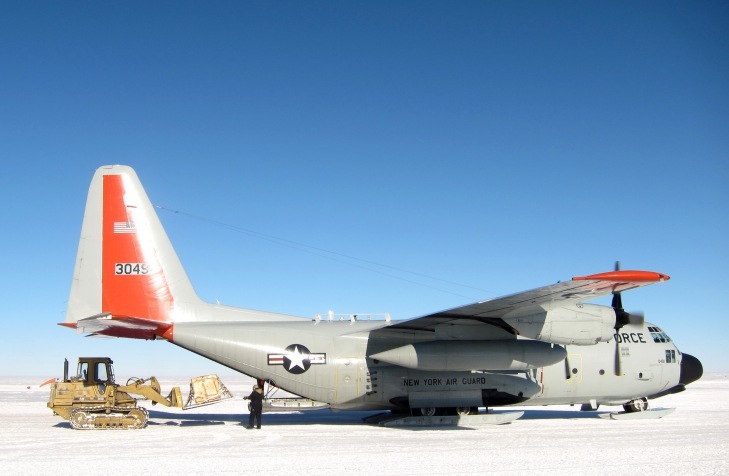 The manager also coordinates with the Air National Guard unit based in Kangerlussuaq regarding manifest or schedule changes and relays this to the team at Summit. 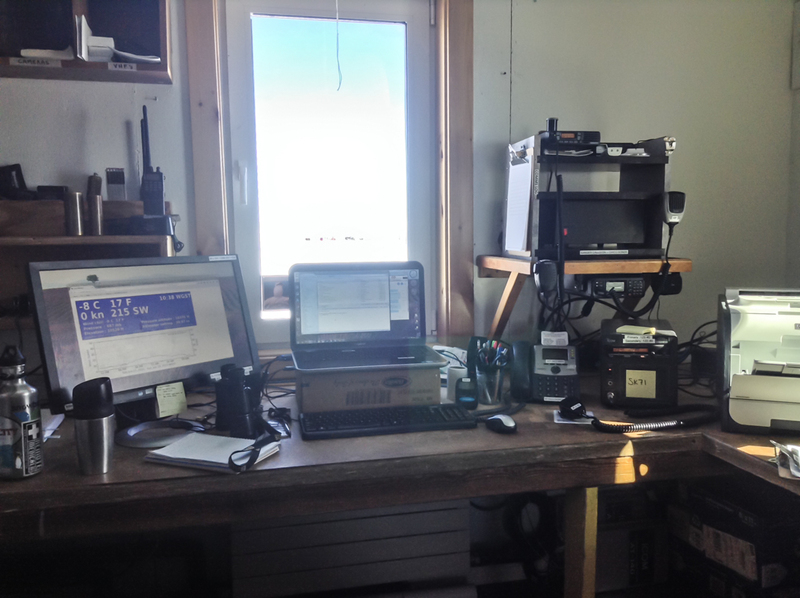 When a plane is in the air we monitor designated HF and VHF channels in the Big House. 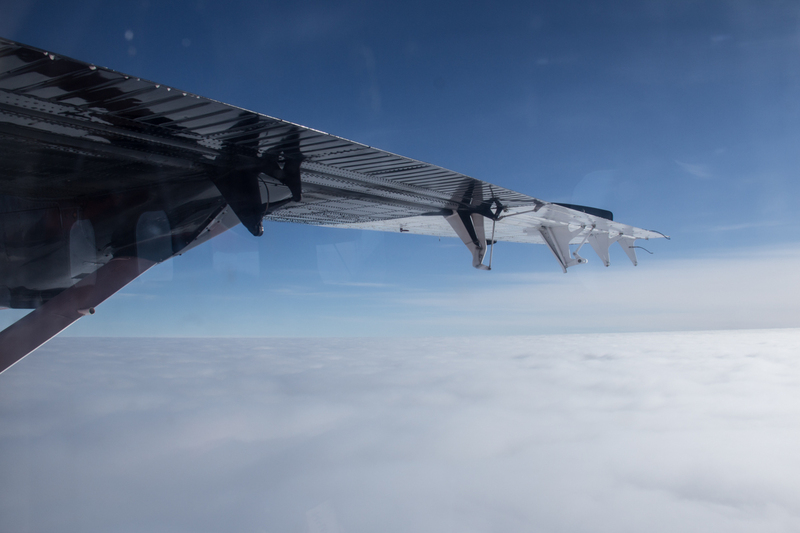 Once the plane is approximately 30 minutes out we are able to make contact with our air to ground radio and confirm current weather conditions, estimated fuel amounts, and cargo details. 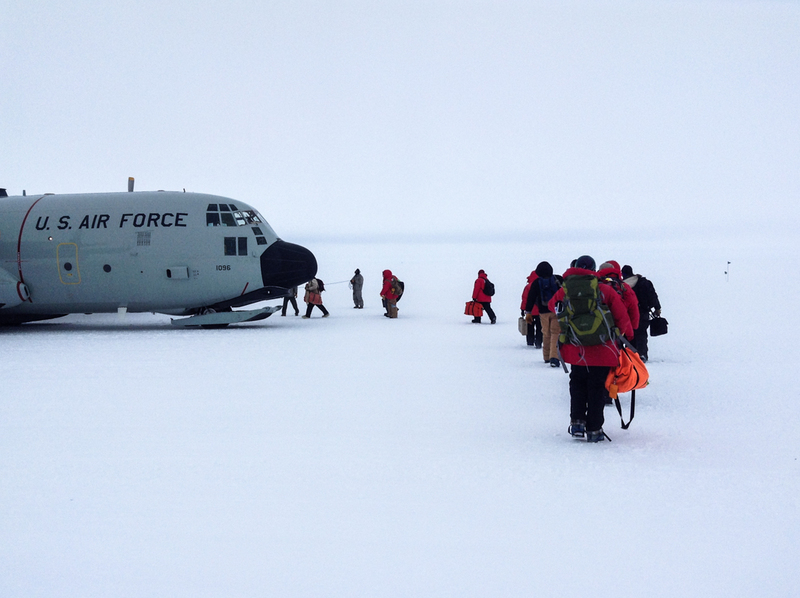 The herc lines up with the skiway and comes in to land, much like on a tarmac runway except there are large skis that sit below the wheels. These can be raised or lowered so they can take off on the tarmac of Kanger and land on our snow skiway. 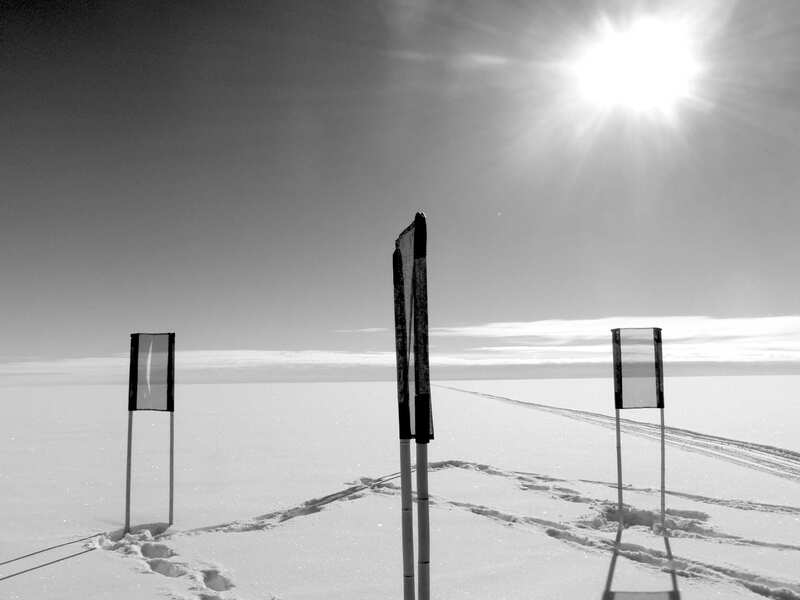 The skiway at Summit is one of the longest in the world – 3 miles long and lined with rows of black flags. Approach flags extend 2 miles off both ends of the skiway. Near the station are the fuel pits and a groomed area marked off by lesser flags, this is the taxiway where the planes park for fuel and cargo operations. 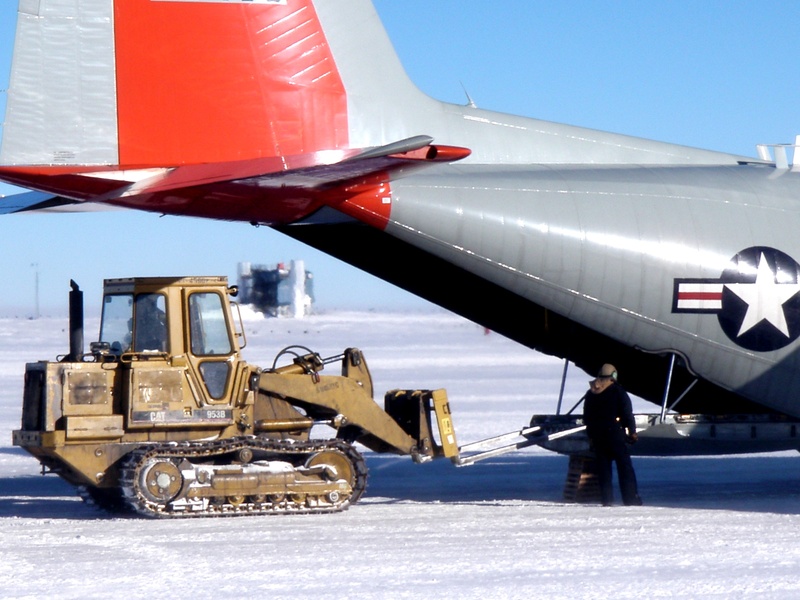 Once the plane has landed and pulls off onto the taxiway, the skis are raised to prevent them from freezing to the snow surface. 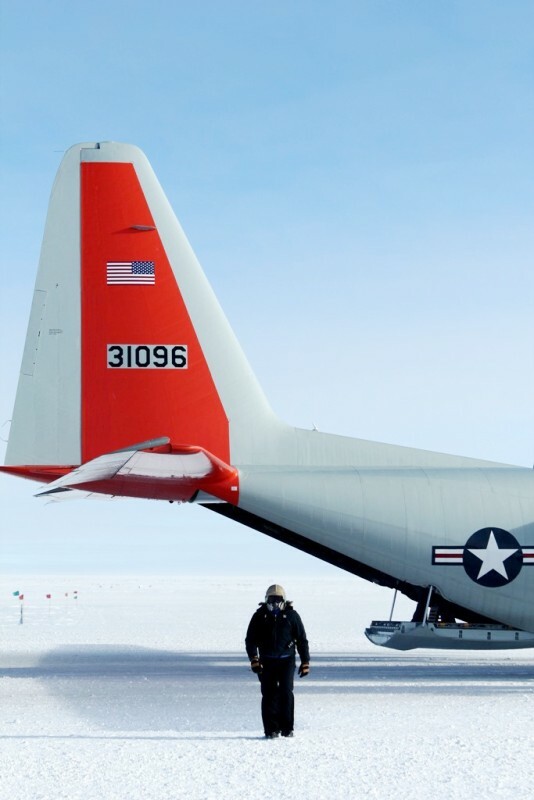 While the plane is on the ground at a cold remote site such as Summit, field camps, and the South Pole – the propellers are left running to circulate fluid and to avoid potential problems from shutting down and restarting the engines. It makes for a very loud and potentially dangerous environment. The propwash is incredibly strong and the exhaust at any point behind the tips of the wings is overpowering so those working behind the plane in the exhaust plume wear fitted respirator masks. When it gets really cold (below -50F or so) contrails form on the ground limiting visibility and restricting cargo operations. A skier coming in to land at the South Pole – contrails grow pronounced in the very cold. On the ground the loadmaster steps off herding the pax if any, away from the props and around the front of the plane. The flight engineer follows and walks around the wingtip to the fueling port while the rear doors of the plane open and cargo offload begins. Our mechanic hauls out the heavy duty fuel hose just under the wing and works with the flight engineer to pump fuel into our bladders and tanks. This flight period we’ve been averaging about 3000 gallons of fuel per flight. 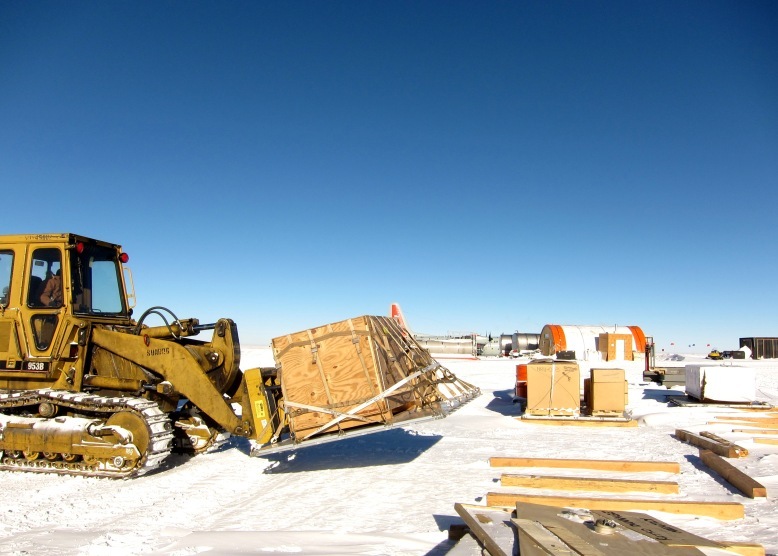 Meanwhile cargo is unloaded and loaded onto the plane with loaders or sleds. 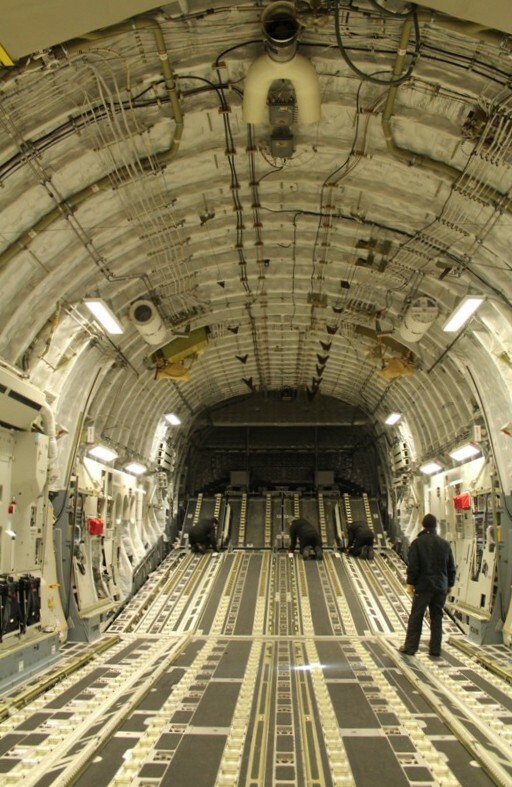 The Hercs can fit 6 pallets with no pax. In the office I relay information over two different radios between the flight crew in the plane and the folks on the ground and back to Kanger as necessary. Often the pilots will want updated wind speeds and altimeter readings or forecasts from Kanger. I log all operations, communications, fuel numbers, and pallets loaded with their weights and dimensions, watching as I can from the Big House office. The planes are often on the ground for an hour to an hour and a half, though it’s a fast hour. Once they depart there’s a weight off of everyone’s shoulders. 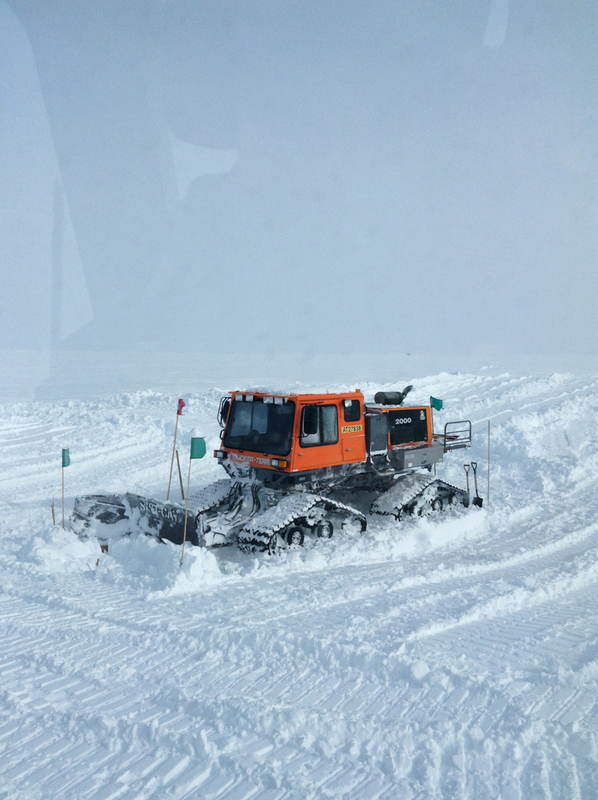 Folks get busy cleaning up – reconfiguring our fuel system to transfer fuel between tanks and bladders, checking in and delivering cargo, grooming the skiway as needed, delivering baggage, and orienting passengers new to Summit. With cargo and fuel operations completed any departing pax are ushered onto the plane and they prepare to depart. On skiways, especially here at Summit, being at 10,550ft and with summer temperatures as warm as 25F, taking off can be a bit of a challenge. 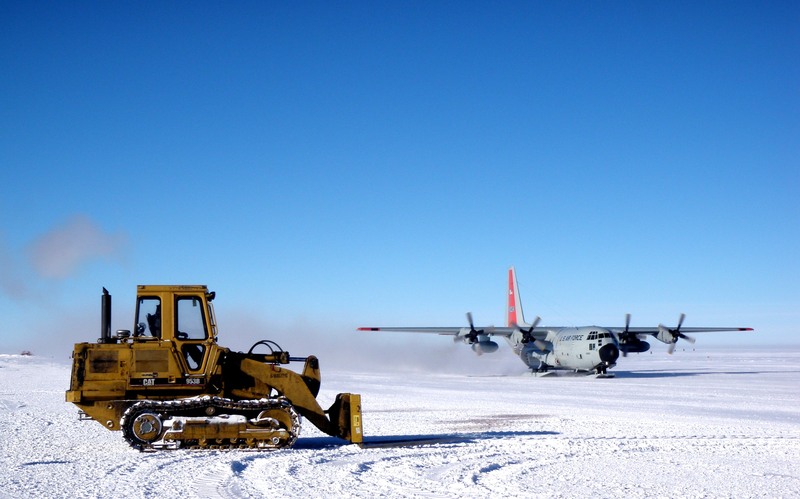 Soft sticky snow, thin air, heavy loads…all of these can result in a futile “slide.” The plan taxis back onto the runway and gives it a good go – engines gunned, props spinning, snow flying up behind the skis…they rush down the runway with all eyes on station watching for the moment they offdeck. Often they just can’t get enough speed and at the end of the skiway they feather the props, slow, and turn around for another go. They gun it again, the sound washing over the station…props spinning, snow flying up in a cloud behind the plane, binoculars are out and folks are pressed against windows and on the decks, holding their breath. 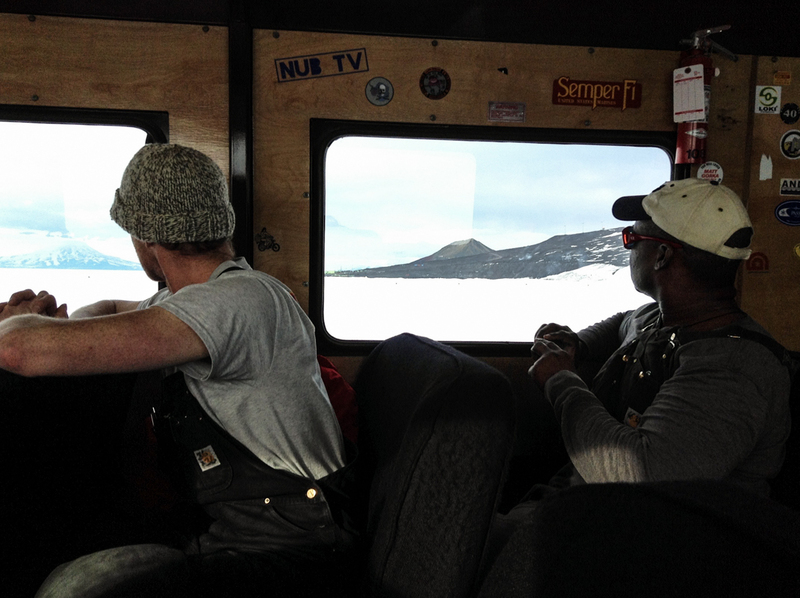 This time the front ski lifts…a little more…and the back skies are off the snow – we have an offdeck! Someone shouts over the radio “the skier is offdeck!” and I log it in my records and send out a notice to the wider group that the skier is headed off. We’ve had good luck this flight period – almost no slides. 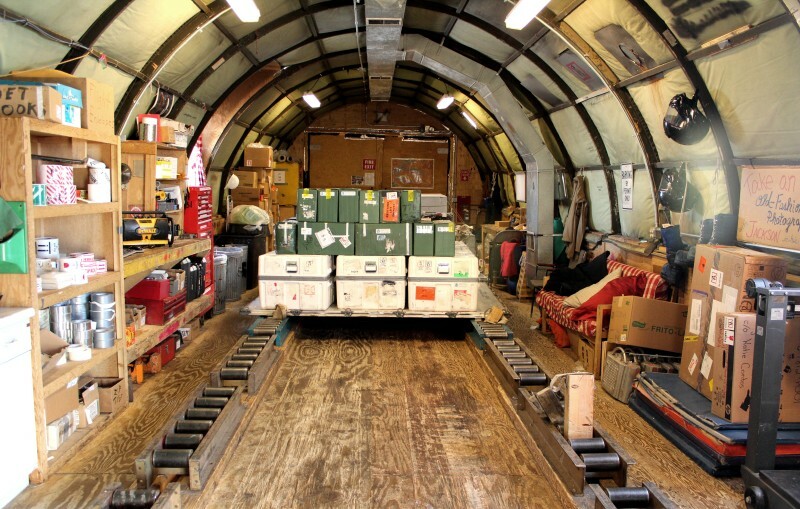 The most I’ve seen here at Summit is 11 tries…at that point they had unloaded most of the cargo and even taken on some of the fuel they just delivered. The fewer slides the better. The earlier in the day the colder…the better. Flight days are long and sometimes stressful, but they’re exciting too and it’s always good to see retro cargo leave and to receive mail and freshies! Today’s flight was the last of this flight period. We sent off 19 pax leaving just 11 of us here on station. 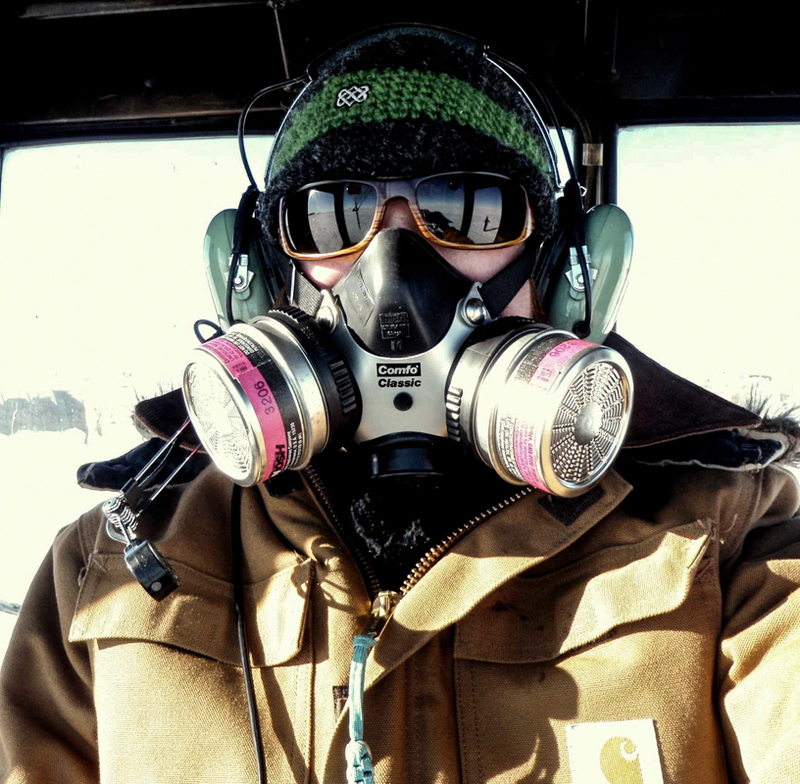 It’s stormy today – 20 knots, and while it’s only about -10F the windchill is -35F! 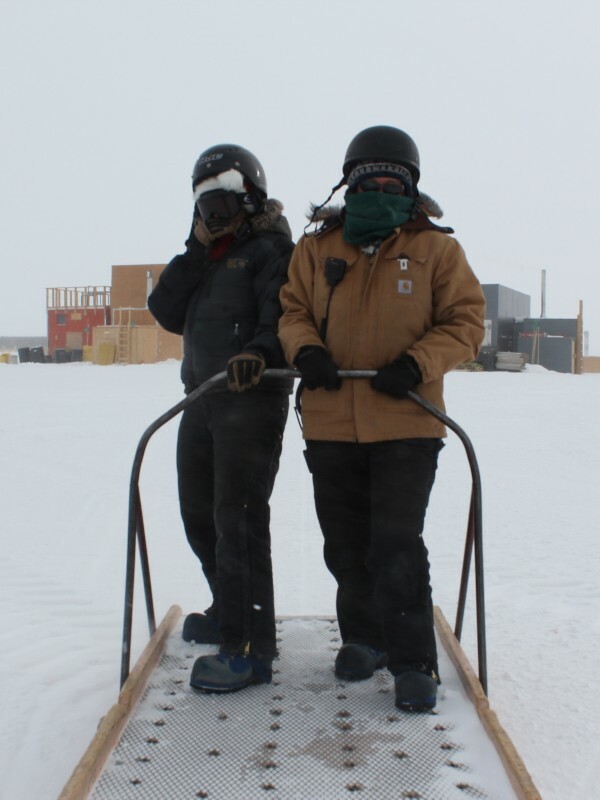 Trudy and Megan riding on the sled behind the snowmobile after a run of deliveries. When it’s windy like this, the snow gets picked up and visibility decreases significantly. 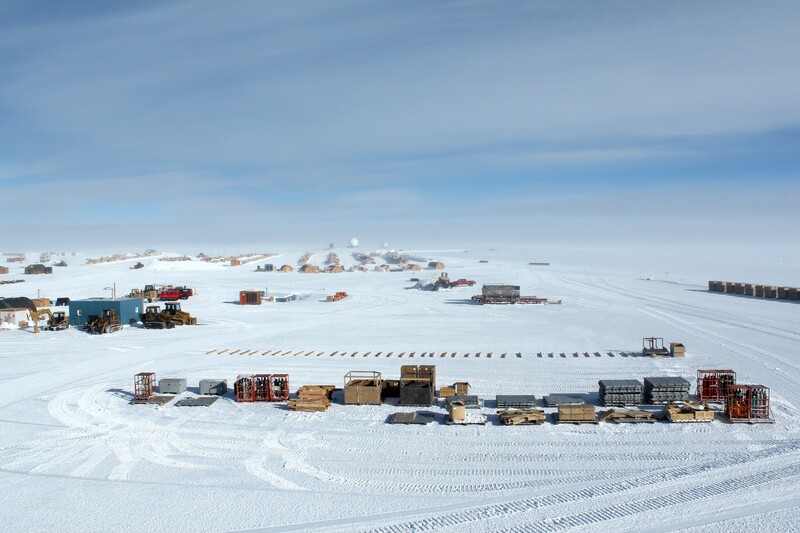 There’s still quite a lot of outdoor work to be done, and we’re busy with delivering cargo from the two flights we got yesterday, but mostly everyone tries to find work inside. Finishing up deliveries, then rolling cargo straps and cleaning up the clutter that collects during the busy week. It’s a nice contrast from day after day of clear bright blue. The flat white horizon blurs with the white sky and tendrils of new snow drifts snake out from anything near the ground. When the horizon disappears some call it being “inside the ping-pong ball.” It’s chilly, with the wind blowing through seams and up jackets, and the snow grains in the air scour at bared skin. I’ve heard more than one person today say with a grin “Finally it feels like I’m in Antarctica!” But still a good day to stay inside. 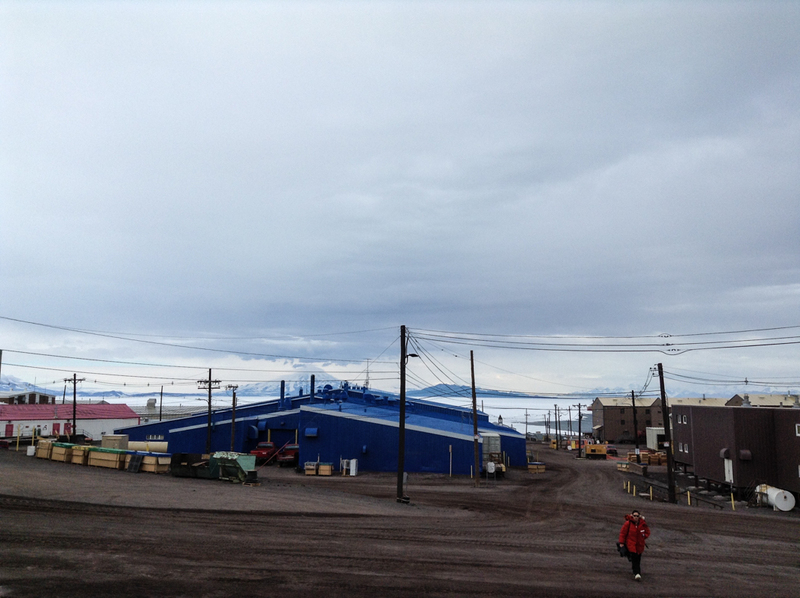 The Waste Yard and Summer camp as seen from the cargo office, with a gust everything disappears into whiteness. 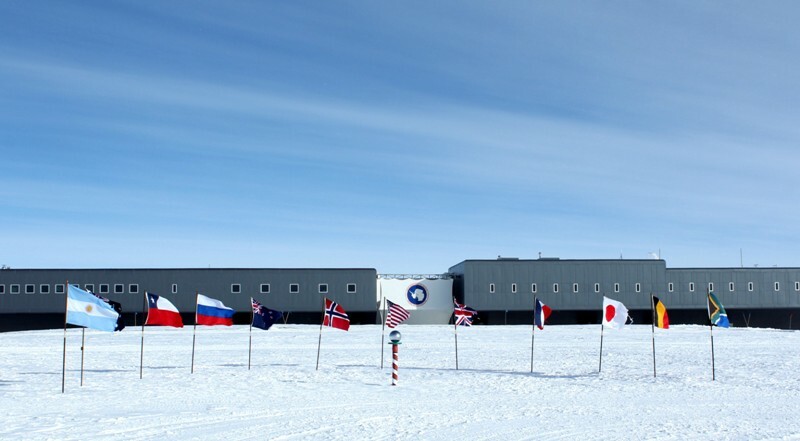 Christmas is this weekend and we’ll celebrate with two days off, another fancy dinner, caroling to the other Antarctic Stations on the HF radio, the “Race Around the World” and a white elephant party for Logistics! We got a huge load of mail the other day and everyone’s looking forward to the extra day off. 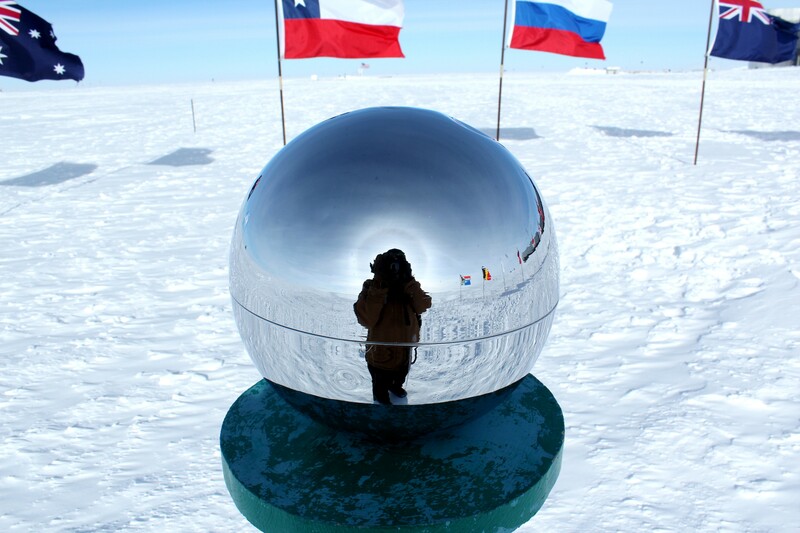 The South Pole can potentially get flights all day from 10 in the morning to midnight. For one shift that makes for an extremely long day so Cargo runs a Day and a Swing shift. The day shift works from 730am to 530pm, while swing works 300pm to 100am. We generally switch halfway through the season and for the first half at least, I’m on swing. It’s day all the time here, the sun being up 24/7, so it doesn’t really matter when we work; the station operates 24 hours with day, swing, and night shifts. Waking up around 11am I get a bowl of cereal and a cup of coffee and sit with friends while they eat lunch. Since we don’t start work for a few hours I have some free time to write or try to catch the internet if the satellite is up. At a quarter to 3pm I put on my gear and head out to the Cargo office. The day shift is in full swing. 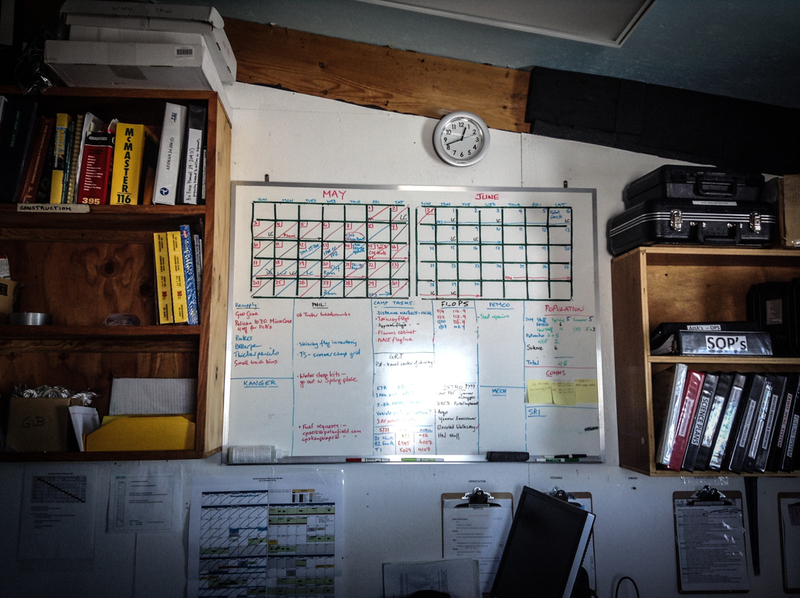 Christine sits down with Zondra, the other load planner, and starts working on the paperwork for the upcoming flights. We gather in the office first for a quick summary of the day then head over to the DNF for a half hour of stretching. This is built into the schedule for everyone down here; stretching regularly significantly reduces the number of strains and sprains caused by physical labor in the cold and altitude. It’s also a lovely way to fully wake up and figure out the plan for the day. Then it’s to work. If there are no imminent flights we start either organizing and building pallets of material to go out or tearing down recently received pallets. 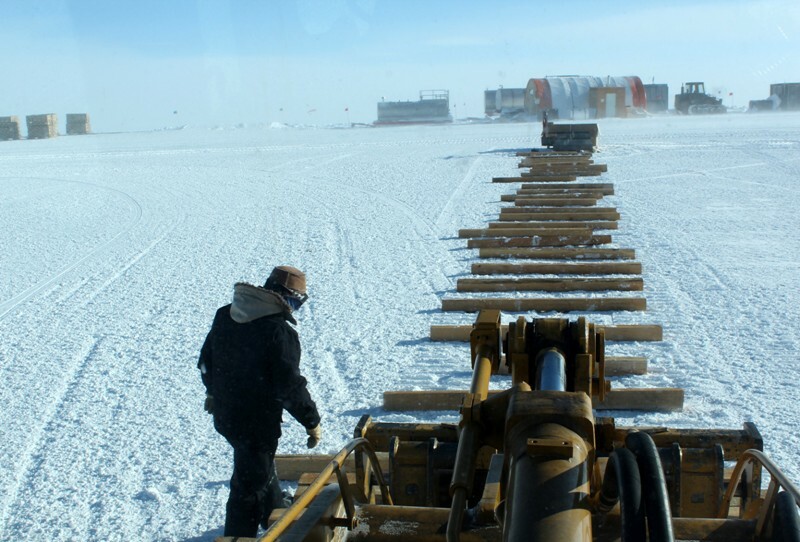 If it’s windy and there’s a lot of drifting we might pull up the rows of dunnage (4”x4”x6’ long pieces of wood that pallets sit on) so Equipment Ops can groom. Or we might lay down the rows of dunnage on a freshly groomed line. As the day shift winds down we pick up where they left off. At around 1800 (6pm) we head in for lunch. It’s a little weird being 6hrs off from everyone else, having lunch and getting ready to head back to work as everyone else finishes dinner and settles in for the night, but I like the quiet and calm of swing. There are no, or very few, deliveries to be made as most folks work days. We can just focus on building pallets and working the flights. This week it’s Thanksgiving so we don’t have many flights at all, last week however we were getting flights at 1900, 2000, and 2200 which made for a quick and busy shift. At 1930 we collect and make a pallet of any baggage for pax going out the next day and mail from the Post Office on Sundays and Wednesdays. With little or no flights we’ve been focusing on waste pallets. 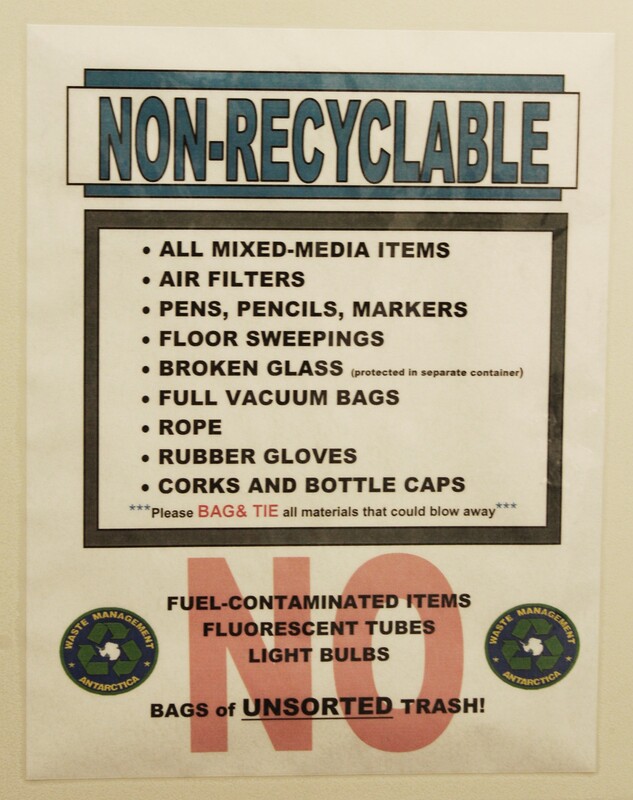 Over 60% of the waste generated on USAP stations is recycled. Here at Pole we have to ship everything out to McMurdo in 100 cube “triwalls” (or the biggest burliest cardboard boxes you’ve ever seen). 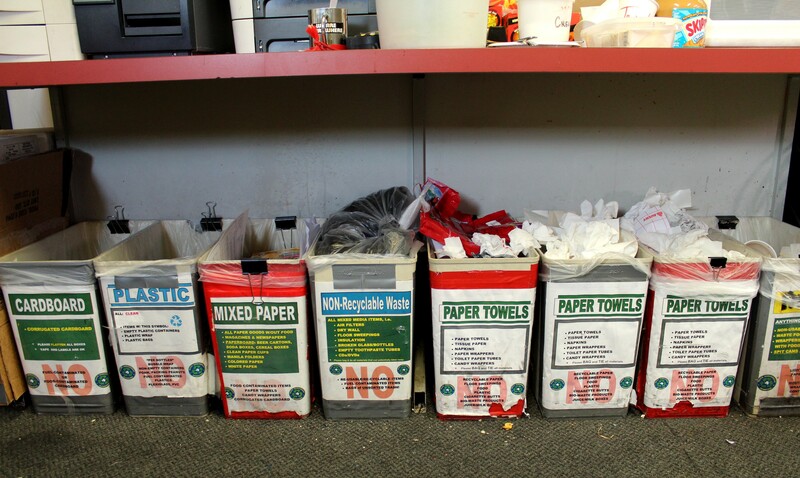 I’ve gotten used to it by now, but it can be a daunting process to throw out a piece of trash! Is it metal? Is it ferrous or non-ferrous, light or heavy metal? Is a cracker box bandable lightweight Non-R (non-recyclable) aka Paper Towels or is it mixed paper or cardboard? How about a piece of plastic? With a recyclable triangle mark it goes in plastic, otherwise Paper Towels. The “Wasties” are always happy to answer a quick radio call asking where something goes. Good clothing and other reusable items are put in “Skua.” A skua is an Antarctic coastal bird that is like a really big, mean, vicious seagull. They are notorious in McMurdo for swooping down and snatching up anything food related or really just anything that catches their eye. Nothing is safe – a cookie in hand from the galley is particularly risky. So Skua has become a verb and a noun. “I just skua’d these awesome shoes!” or “Try checking Skua for a new fleece…” With baggage fees nowadays and lots of people coming and going there are often good finds. Back to our tasking…the Wasties collect the triwalls of waste and we use the CAT 950 (aka Big Foot) to stack them on the pallets, fitting cargo nets neat and tight around the pallet (easier said than done). Averaging 88” they’re well over my head and it can be challenging to reach the side straps of the higher straps of the topnet. After they’re all built up we weigh and measure them and put them on the line to ship out on the next plane. It’s an ongoing process and with some music and good humor can even be fun. Right now we’re all working on waste to catch up from winter and to get set for when we have lots of flights again. At midnight we start cleaning up. 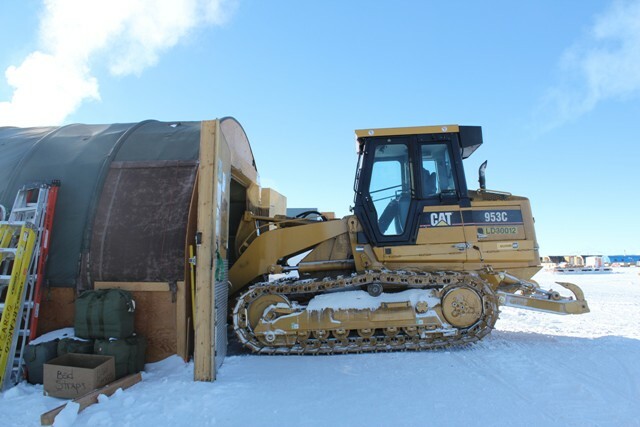 It takes a while to fuel the equipment and put them to bed. The diesel engines need to run for a while after being worked, so we let them idle at a low rpm as we chip off the built up snow and ice from the tracks and moving parts. 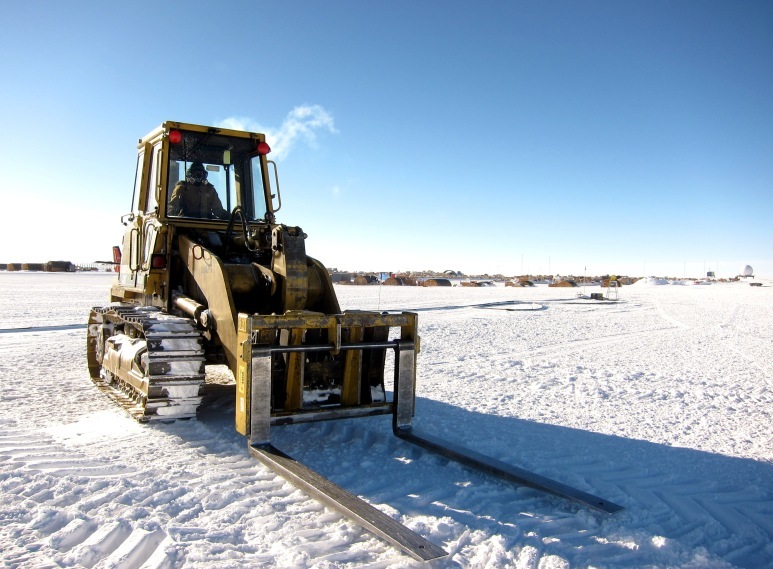 It’s cold work – holding the freezing heavy metal pry bars used to chip off the ice. After filling in our time cards it’s time to head inside for Midrats – the meal served from midnight to 0130. The station is quiet and the sun is shining into the galley. It’s a nice time to chat and laugh about the flights and drama of the shift. Then the walk back to Summer Camp and sleep. This season I’m working as an “Air Transportation Specialist” or ATS-1 in Cargo. Pretty much everything here at Pole arrives via the C-130 Hercs. 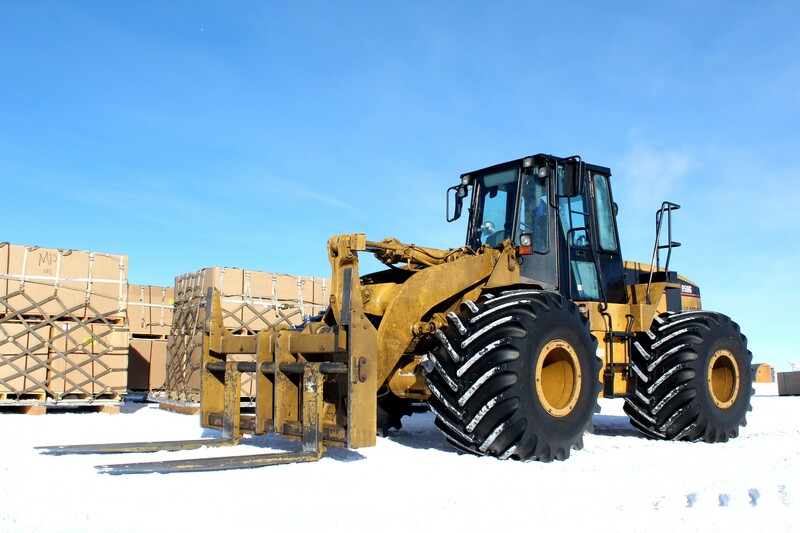 It’s our job to unload the pallets of material from the plane using a CAT 953 or 950 loader (be it food, welding equipment, toilet paper, or science gear), disassemble or “tear down” the pallets, and deliver the goods to the appropriate place. 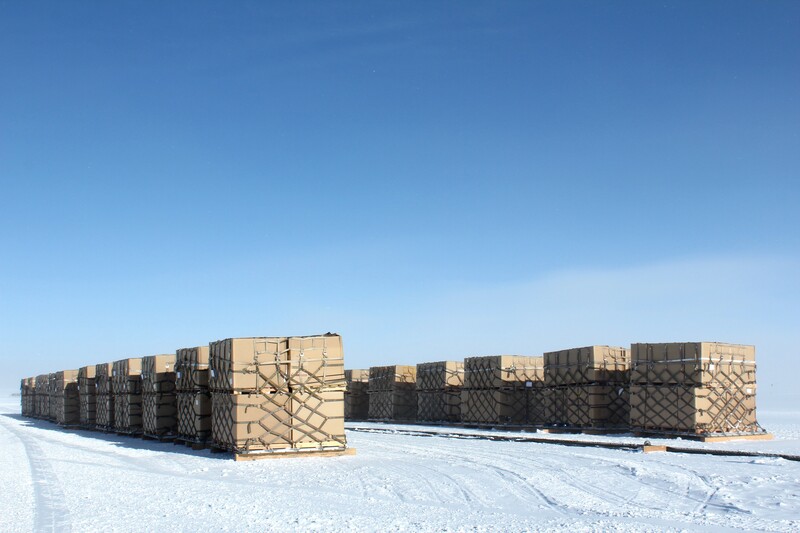 The other side of our job is to collect any material leaving Pole, package it on pallets and send it out. The pallets we use are generic US Air Force pallets. 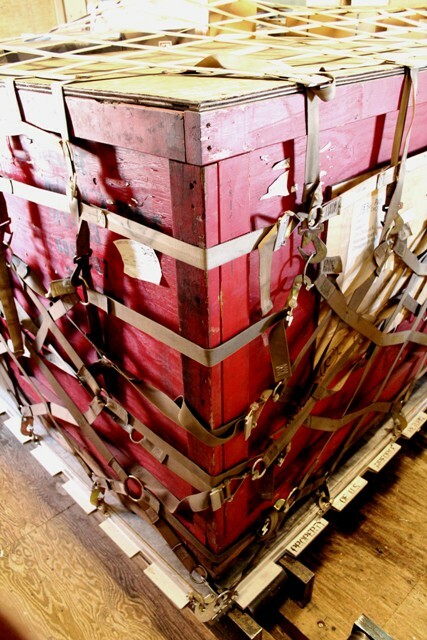 Special nets hook onto D-rings along the edge of the pallet and drape over the cargo to secure it as well as chains and ratcheting cargo straps if necessary. 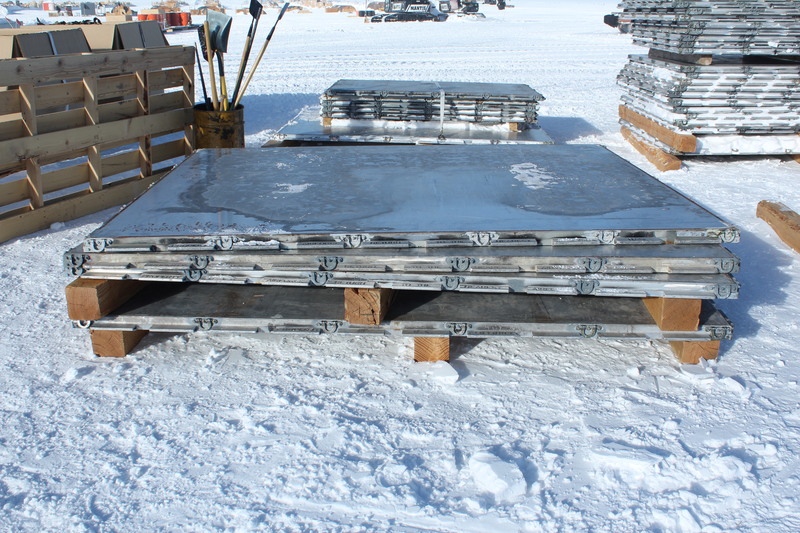 A stack of “US Air Force 463L Pallets.” With an aluminum exterior and a balsawood core they are each 88”x108” and 290lbs. 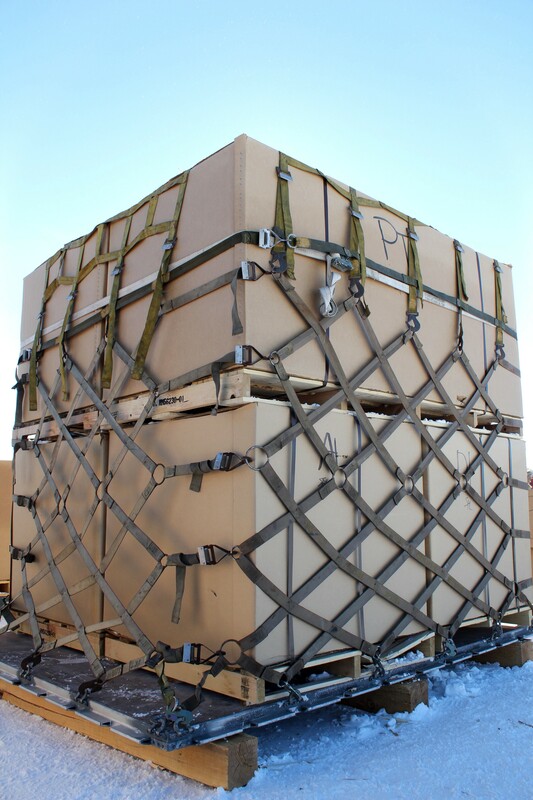 Cargo side and top nets hook together and cinch down to secure material to the pallets. Cargo straps are used all the time for securing odd loads. 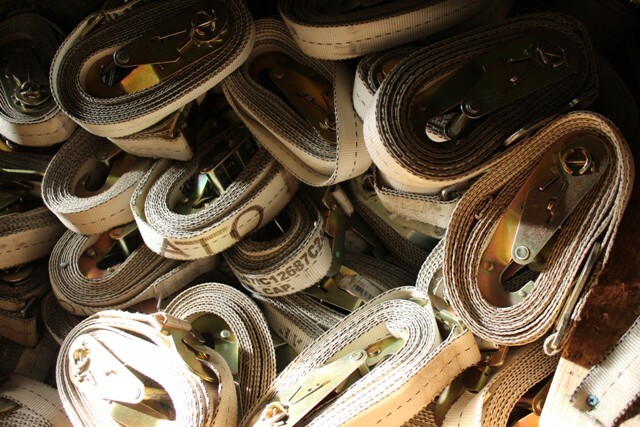 There is a huge box of straps in the DNF building and there are always straps to be rolled. We get anywhere from 2-7 Hercs a day depending on weather, mechanical issues, and demand. This is my first year working in cargo and we’ve spent most of the time so far training and leaving the actual flight operations to the returnees, but last week was the first time I worked a flight. 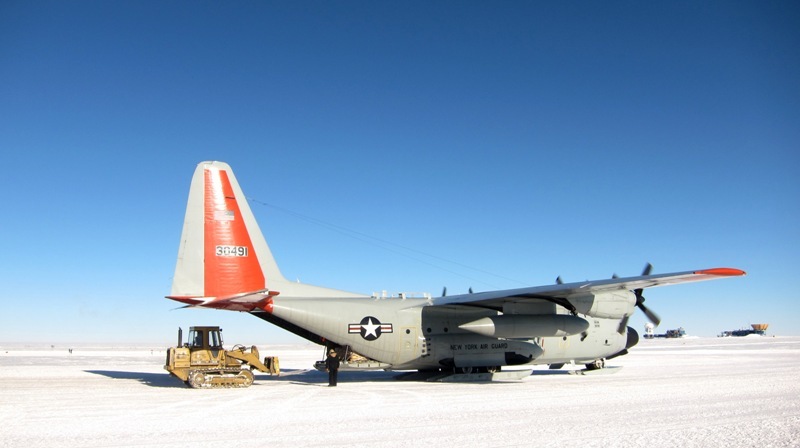 Over the past two years I’ve worked quite a bit with the Hercs at Summit Station in Greenland so it was not as intimidating as it might have been otherwise. Nevertheless, it’s always a rush and this was my first time operating heavy equipment in close proximity to the very expensive airplane. About half an hour before the flight arrived we gathered in the heated break room/office to figure out what exactly was coming off the plane and in what order. All the necessary details are written each morning on a white board by the Load Planners. 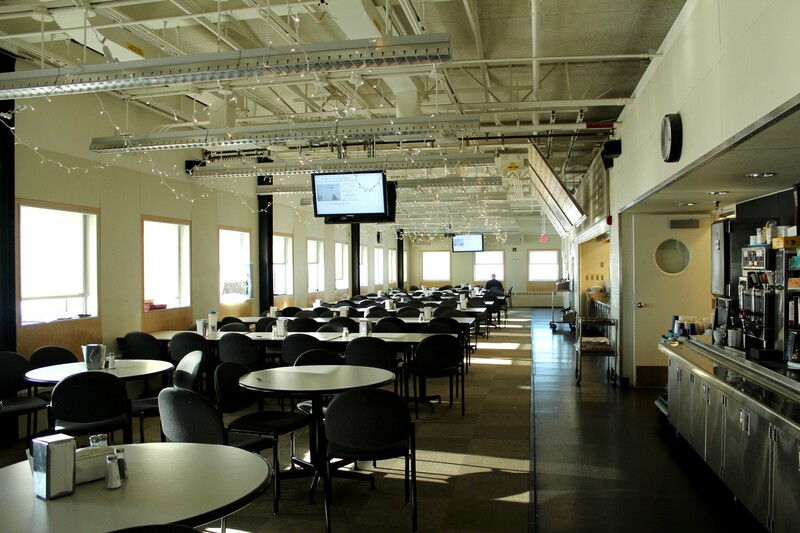 The Cargo Office and break room. 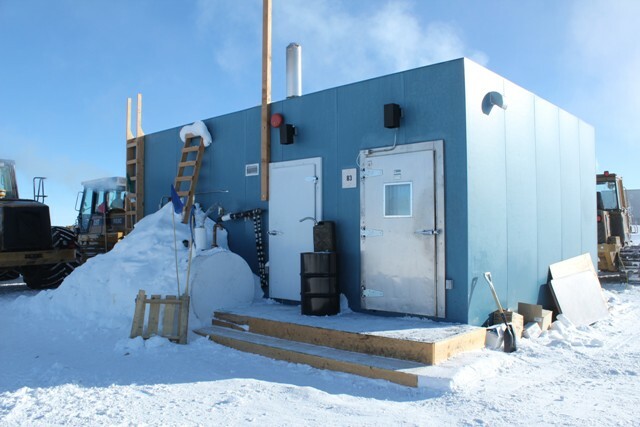 Our equipment is plugged in around the edge of the building – equipment here have little heaters that keep the fluids and engines from freezing up when not running. The necessary details for each flight. 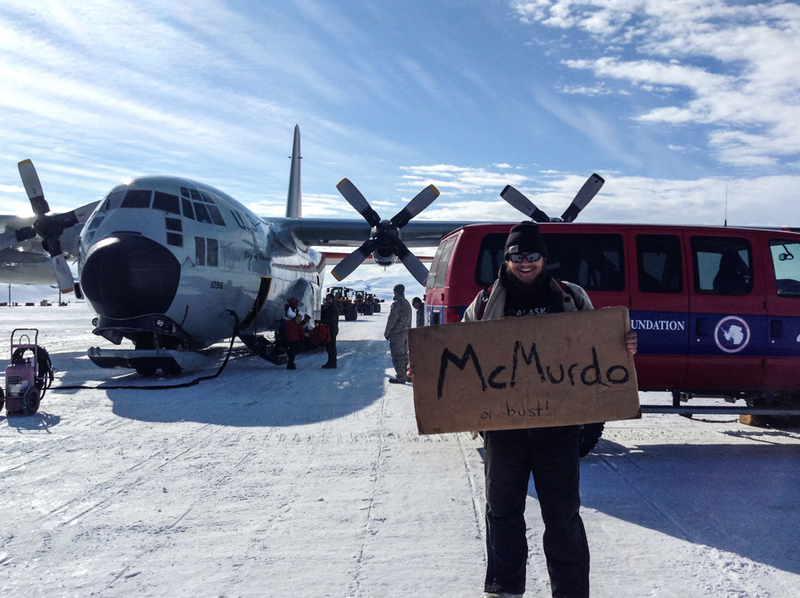 Each individual plane has a unique tail number, Herc flights to Pole are numbered sequentially so as of this picture we’ve had 39 flights so far this season, the estimated and actual times leaving McMurdo and ETA at Pole, cargo specs for incoming and outgoing cargo, and whether or not there are any passengers (aka pax) going out and the number of bags. Geneieve and myself were working the plane. 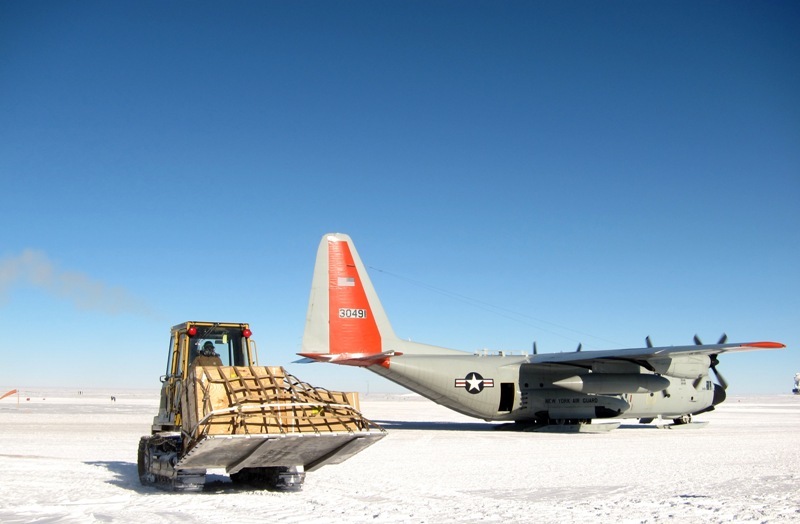 Depending on how many pallets are coming it takes one or two loaders and an “ATS-2” or a cargo senior to work a flight. 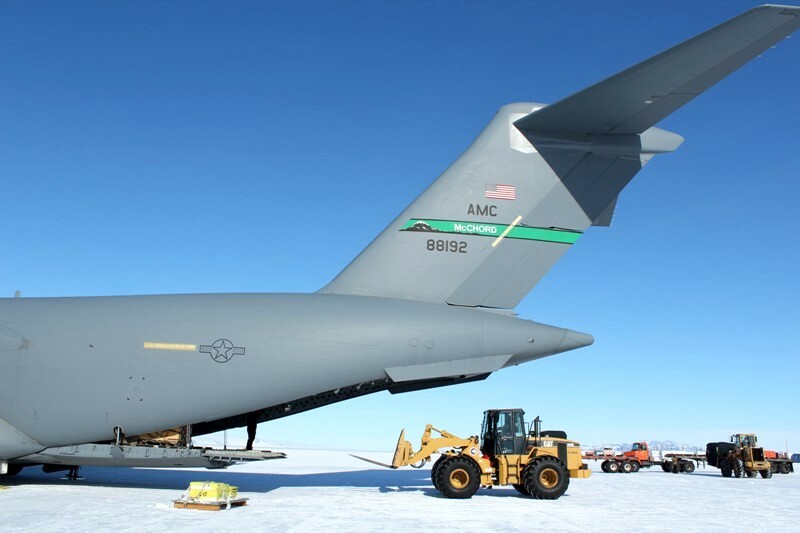 The senior stands at the very back of the plane when the ramp is open coordinating between the flight crew and the cargo folks, helping the loadmaster inside the plane push pallets out onto the forks, and marshalling us in if we can’t see the loadmaster. Around 20 minuets out Comms announced on the radio the new ETA for the plane. Communications, or Comms, here at Pole is 911, 411, and basically, as the name implies, the hub of all information and communications. That’s our signal to get ready. Bundled up, we head out to the flight line. In addition to our ECW I’m wearing a giant respirator to help protect against the nasty Herc exhaust, it’s not great stuff to breathe in and while the respirators work well my clothing smells like Herc for days. I also have on a large radio headset that blocks out the noise of the plane while enabling us to communicate and hear what’s going on between all the teams involved with a flight. Wearing my respirator and radio headset - All senses secure and ready to go. A flight involves cargo, “fuelies” who either take or give fuel to the planes, and a team of firefighters standing by in case of an emergency. Most of our night flights are “tankers” that bring in one or two pallets and several thousand gallons of fuel. It takes all summer to get enough fuel for the winter. On Tuesday we had 6 tanker flights that brought in over 18,000 gallons of fuel! The plane which was just a slight speck in the sky, the exhaust plume more visible than the plane itself, is suddenly very close. A billow of snow and exhaust rise up behind it as it slows and then turns to glide onto the taxi way. 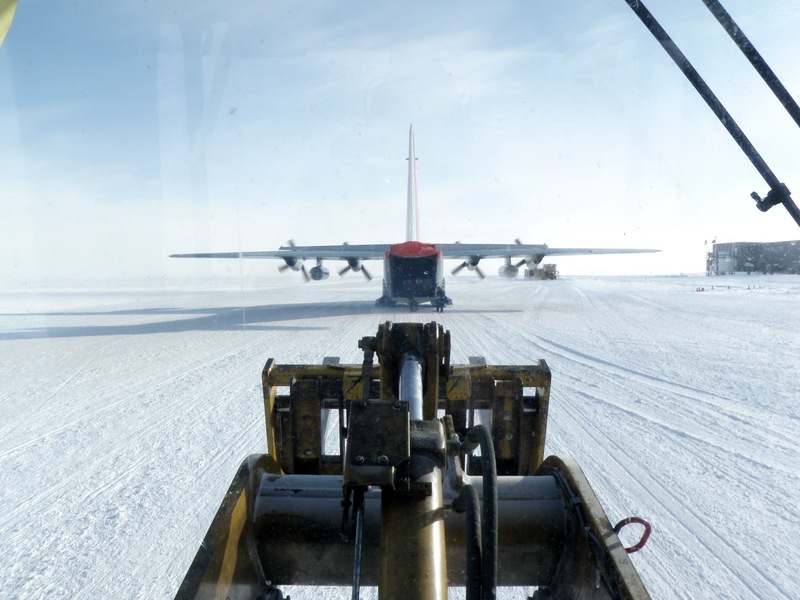 Waiting in the loader as the Herc approaches. Photo by Genevieve. As the plane approaches the roar of the engines builds. It’s loud. Crossing in front of us close enough to hit with a snowball, it continues moving forward towards the fuelie who is marshalling it in. I can see the pilot and co-pilot in the cockpit. The pitch deepens as the prop blades change angle and the plane comes to a stop next to the fuel hose. The back of the plane opens and it’s our signal to pull forward. 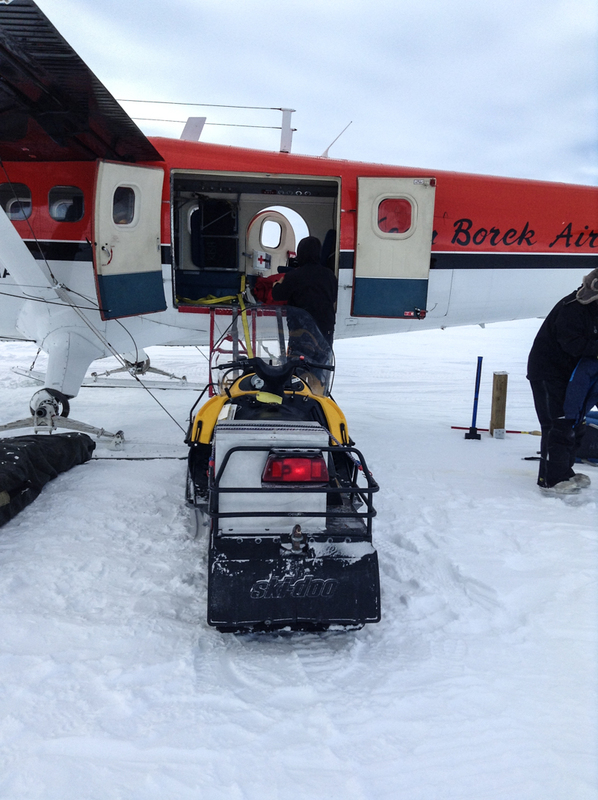 The pilots raise the skis, lowering the plane onto the wheels. The skis are warm from friction and will freeze in place to the taxiway if left down. There are three pallets coming off this flight. A half sized “speed pallet”, an awkward pallet loaded with two snowmobiles, and a load of pax bags and other DNF material. 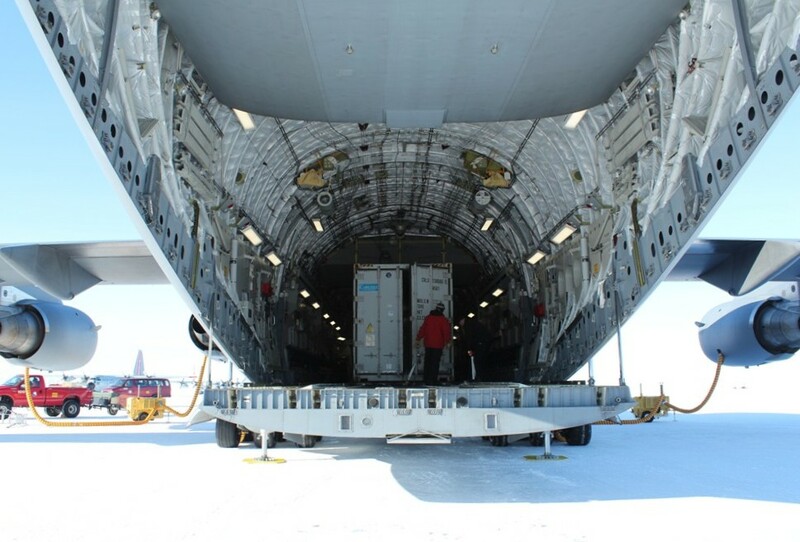 DNF, or “Do Not Freeze,” is placed in one of Cargo’s two buildings which we call simply… “DNF” – a long jamesway with double doors on either end and rollers installed on the floor inside. 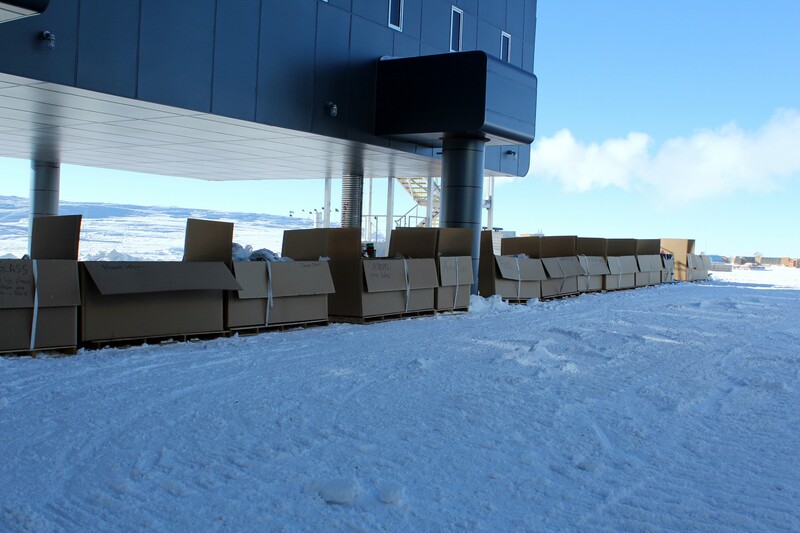 We can store up to 5 pallets inside to keep whatever it is from freezing: Batteries, mail, pax bags, and freshies. I roll forward into line with the back of the plane. The respirator is working well and while I can see the brown exhaust and blown snow rushing past the cab I can’t smell a thing. The headset is working well too; the roar of the plane is audible, but not deafening. I can hear the fuelies talking about which valves to open and which tanks to fill. I raise my forks and continue moving towards the black gapping hole that’s opened in the back of the Herc. Breath. Move slow. The view from my loader as I approached the aircraft to receive the first pallet. Usually we wait for a minute or two in line behind the aircraft while they adjust the ramp, before the loadmaster signals us forward. Slowly I roll forward, as we move beneath the tail of the plane the loadmaster takes over and my focus shifts from the big picture to the loadmaster and the movement signals he’s giving. Photo by Genevieve. I focus on lining up as precisely as possible with the rollers in the plane’s floor and glance at Sean (the ATS-2 for this flight) to see if he has any directions to give. With the sun shining bright off the white snow it’s hard to see inside the dark plane. 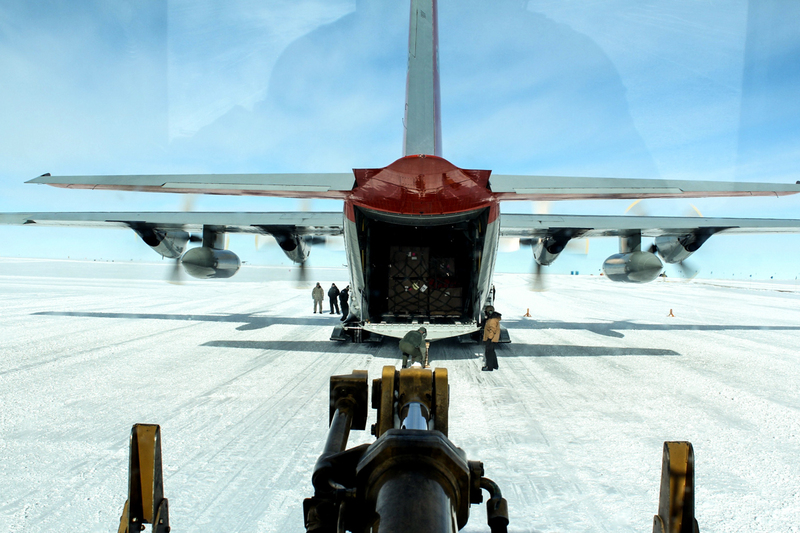 As I get close to the tail of the plane I can see the loadmaster step into view. He steps out to the back end of the ramp and waves his arms marshalling me towards him. I focus on him – so close to the plane we must follow his hand signals without fail. Sometimes it can be difficult not to anticipate what they’ll need, to give up fully and trust him or her, but it’s crucial that we follow the signals slowly and reliably. I move forward until the tips of my forks are inside the plane, the loadmaster is to my left now, still on the ramp. He lines up the forks and gives me the signal to lower the boom so the tips rest on the edge of the ramp. I comply, inching slowly downward. Sometimes they can seem impatient, as Genevieve said “Yelling at us with their hands!” But it’s better to go too slow than too fast. Tips resting on the ramp of the plane the loadmaster checks inside to make sure everything is perfect. Sean stands to the side ready to help or relay signals if needed. This close I’m almost out of the rush of exhaust and prop wash, it’s quieter. Photo by Genevieve. 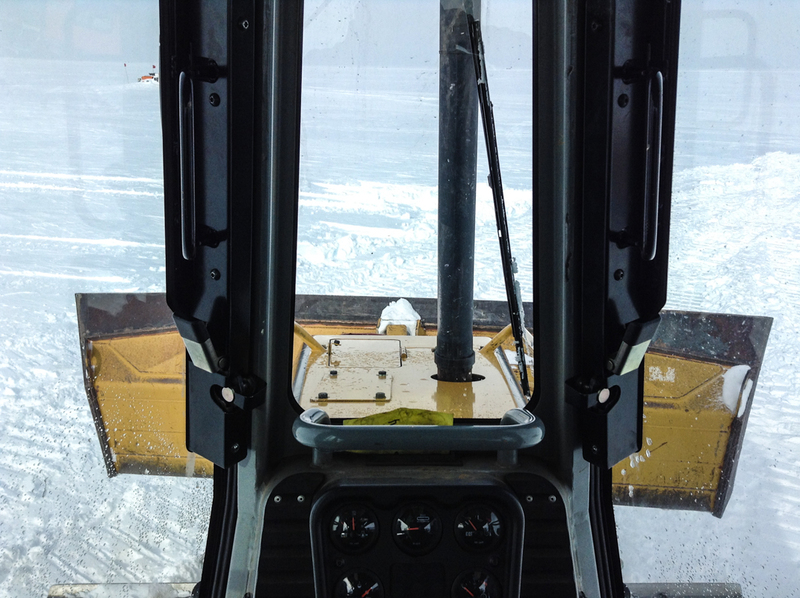 A picture I took of a different flight with Genevieve in the loader. Slowly backing away from the plane with the pallet on my forks I move out from under the tail and out of the way of cargo being uploaded. Photo by Genevieve. Taking the pallet to the cargo yard or DNF. Photo by Genevieve. 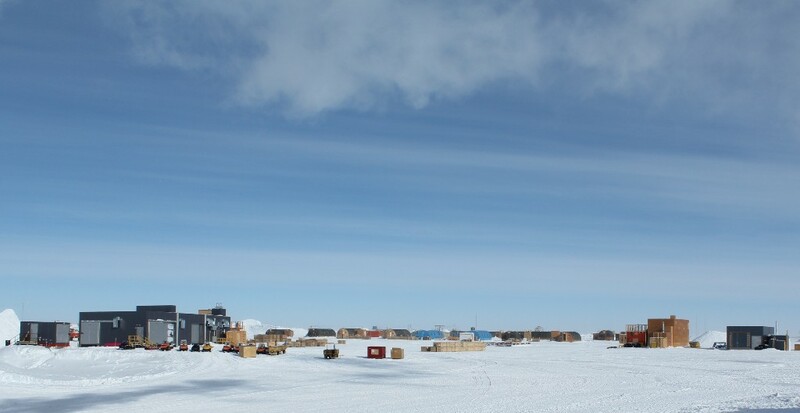 I back slowly away from the plane swinging towards the cargo yard and out of the way of Genevieve who will repeat the process and set the little speed pallet on some wood on the side of the taxi way. It’s not DNF so it will sit there until we have time to bring it into the cargo yard and take it apart. The pallet off my forks I back up further and get in line for the third pallet. Genevieve plucks off the second pallet and very slowly drives it into the cargo yard. I move forward again for the final pick. Lowering a pallet onto 4x4 pieces of wood (aka “dunnage”) in the cargo yard. Photo by Genevieve. It’s the same deal, roll forward, follow the loadmaster’s signals, and get the pallet. This one’s DNF so as soon as he waves me off I bring it straight to the DNF building. Another one of the cargo folk is standing by to open the doors and marshal me in. The building isn’t huge and there’s no more than a few inches on either side of the pallet as it moves through the doors. I lower my fork tips and the boom so the pallet rests on the tracks and rolls forward on the rollers. Placing a pallet into Cargo’s DNF Building. There are only a few inches on either side between the pallet’s edge and the door frame. Inside the DNF – it’s crowded, but there’s room for 5 full pallets. I back up and park the loader, coming inside to get a sip of water and put away my respirator and headset. Now that I’m done I can feel my heart beating through my body, the adrenaline rushing, my peripheral vision returning. I take a deep breath and can’t hold back a grin as Genevieve gives me a huge smile and an exuberant high five. We get enough flights that I’ve since worked at least one a day, but it never gets old. Sean walks back to cargo after loading the last pallet. 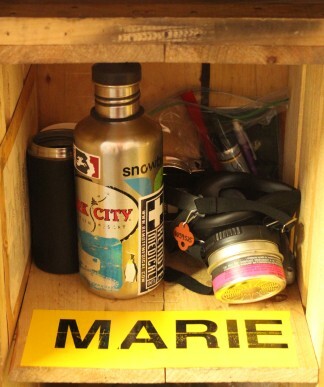 My cubby in the Cargo Office with little thermos, water bottle, sharpies, and respirator. The photos within this post are not necessarily from the described flight. All photos on this blog have been taken by myself unless otherwise cited.